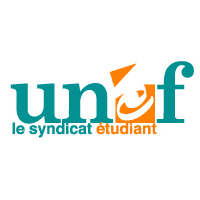 UNEF (Union Nationale des Etudiants de France) is the first main representative student union in France. UNEF is the only union in France present in every university. The majority of student elected representatives in France are members of UNEF (more than 800). UNEF has also the majority of elected representatives in the two national councils: the CNESER and the CNOUS with respectively 5 seats on 11 and 4 seats on 8. UNEF is independent from political parties but is promoting democratisation of higher education within an open, inclusive and free public service. For the UNEF education is not only a public good but also a way of economical and political emancipation. UNEF was leading the demonstrations against the CPE (First Employment Contract) in 2006 and is so part of the social movement.